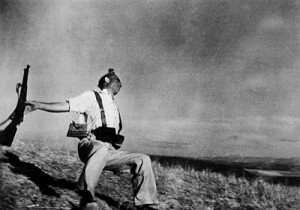 Today, October 22, marks 100 years since Robert Capa’s birth in Budapest, Hungary. One of the most famed photojournalists of the 20th century, Capa’s reputation has been challenged in recent years by claims that the “Falling Soldier,” arguably his most famous photo, was staged. Earlier today, the International Center of Photography released one of the few known recordings of Capa from a 1947 interview in which Capa discusses the history of the “Falling Soldier,” potentially ending the controversy once and for all. To read more and listen to two surviving interviews with Capa, click here.